the cold, wet spring we've been 'enjoying' and a lack of cable tv has meant that my kids have been entertaining themselves with lego every chance they get. every time they get a new set they build it according to the plan. but within days the 'kits' have morphed into a dozen different original creations. the boys tend to make ships, vehicles, and things that move or shoot and nothing seems to be saved in it's original format for long. my daughter tends to create elaborate structures and villages and woe is the brother who steals a coveted piece or a parent who accidently knocks anything over. the nearest mall just opened a lego shop and we've visited several times. the kids love to look at it all but have not harassed us for any more sets. which really is an indication of just how much lego we already have at home. (we've probably spent more on lego than i did on my first car. and anyone who has ever fallen in love with a little british sports car will understand exactly what that means). but this weeks visit to the lego store had me seriously considering a purchase or two for myself. almost the entire lego architecture line was calling my name. mother's day is coming up and lego will last longer than flowers or a british sports car. 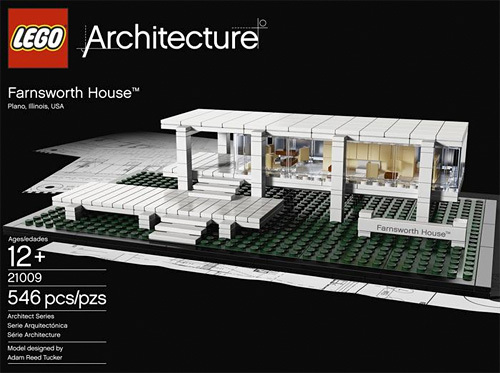 and it's certainly the only way i'm going to own farnsworth house or fallingwater.